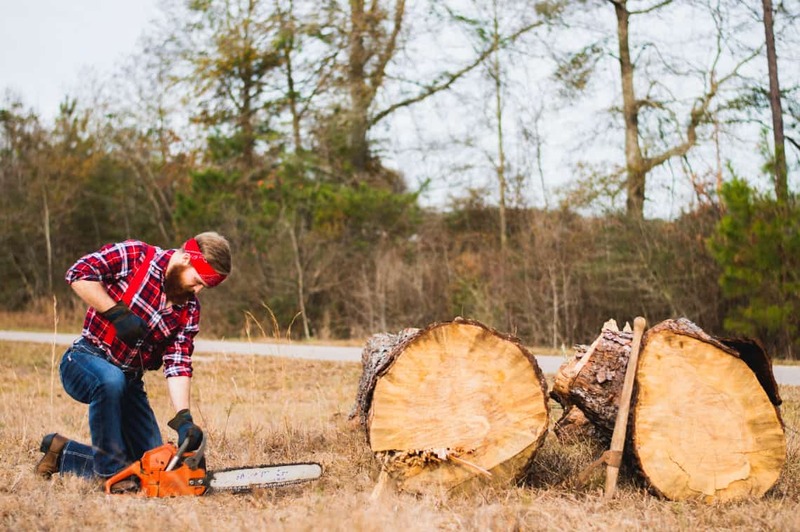 One of the most beneficial tools a homestead can have is a chainsaw. I've used chainsaws for 38 years, in fact our homestead has three. If the homestead heats with wood or supplements the heat with wood, you want to have a good quality professional grade chainsaw. In this chainsaw user's guide we will look at the many different aspects when using a chainsaw. Having learned a lot from my own experience, I give details of the best size engine and lengths of chainsaw bar plus give tips for using a chainsaw. I review different inexpensive professional grade chainsaws (Echo, Poulan, Hitachi, Homelite and Remington), tell how to maintain your saw and sharpen the chain. It absolutely is possible to own good quality, low cost, professional grade chainsaws that do the job and last for years. Even if you do not have wood heat, a chainsaw comes in handy to cut down dead trees and to clear trees and brush after storms. A chainsaw is without a doubt, a very valuable tool to have on your homestead or country property. Choosing the right one and learning how to use it is what I'd like to convey to you so you can make the best choice for your needs. You need a chainsaw with an engine that has enough power to handle the job you need to do. Having enough power means the saw will do the job easily and quickly. There are electric and battery powered chainsaws available, but for felling big trees and cutting through thick, hardwood you need a gas powered chainsaw. Chainsaw engine size is measured in cubic centimeters, cc's. The larger the engine in cc's the more power the chainsaw will have. Professional grade chainsaws have engines that are between 35 and 80 cc's in size. There are very expensive chainsaws that have up to 121 cc's of engine size but they are too big and heavy for homestead use. If you live where there are a lot of hardwood trees like oak, ash and maple, you will be happier with a chainsaw that has a 50 cc or larger engine. If the majority of your wood cutting is softwood like tamarack, red fir and pine, a chainsaw with an engine size of 35 to 50 cc will do just fine. We have one chainsaw that has a 37.7 cc engine and a 16" bar. It is used for cutting small trees, cutting limbs off of downed trees and clearing underbrush. It is a Craftsman chainsaw that was made by Poulan and it is 38 years old. It still cuts just fine. It is light weight but powerful enough to be a valuable tool for homestead use. My 38 year old Craftsman chainsaw will eventually cut down even trees that are 30" in diameter. But that would take a while and both me and the saw would be tired when the tree fell to the ground. You need to consider the size of trees you likely will be cutting down. By size, I mean the diameter of the trees at 16 to 32 inches above the ground. This should be one of your first considerations when shopping for a chainsaw. Are you going to be cutting down trees that are only 12" in diameter or trees that can be at least 60 feet tall and 30" in diameter? The diameter of the trees you expect to be cutting down should determine the length of the chainsaw's bar. The bar is the long part extending out in front of the saw that holds the chain in place. A longer bar helps the chainsaw cut faster and deeper. Chainsaws designed for one person use have bar lengths that range from 10" to 28". Although bar lengths of 16" or 18" are capable of cutting down average sized trees, really big trees will be cut down easier with a chainsaw having a 20" or 24" bar. My large chainsaw has a 20" bar which works best for the trees I cut down for my firewood needs. Chainsaws are powerful tools for specific purposes. Their power also makes them dangerous to use. To reduce the dangers of using a chainsaw you need to look at the saw's weight, it's balance and the saw's handles. Chainsaws come in different weights. You want a saw that is not too heavy for you to use for hours at a time. A chainsaw should feel balanced when you hold it. By balanced, I mean it should not feel bar heavy, where you have to push down on the back handle to keep the bar level. The handles should be located where they feel natural and not awkward when holding the saw. If the saw is too heavy, it does not feel balanced, or the handles make you feel awkward when holding the saw, you will tire easily. The saw's handles should be designed so you can maintain a firm, comfortable grip on the saw. If the saw does not feel balanced you will not be able to make smooth movements when using the saw and this increases your chances of injury. I learned to handle a chainsaw years ago, from a neighbor who almost looked as if he and the saw were one. He was in his mid seventies and made cutting down and bucking trees look almost like he was doing a waltz. If the saw is not too heavy, if it is balanced and you can maintain a comfortable grip on it, you can safely cut with it for hours. That neighbor, George, had worked as a logger in Oregon for years and had retired to Tennessee. He had an old yellow McCulloch chainsaw that he had used when working as a logger. He called that chain saw Big Mac. He and Big Mac could out cut men half his age using new professional grade Stihl and Husqvarna chainsaws. If you were a logger who worked in the woods all day, every day, you would probably cut several hundred cords of wood each year. If that was how you made your living you would want a professional grade, expensive chainsaw made by Stihl or Husqvarna. Their professional grade saws can cost from $600 all the way up to $2,000. Both Stihl and Husqvarna have three grades of chainsaws. They have low priced saws designed for occasional use by homeowners. There are middle priced saws for use by farmers or ranchers that are moderately priced. Then they have professional grade saws that are higher priced. As a country dweller or homesteader who cuts say 10 to 15 cords of wood per year, are there suitable options that are good quality chainsaws but that do not cost near as much as a Stihl or Husqvarna? Yes there are! We will take a look at a few of them. A chainsaw's dry weight is without fuel, oil, bar and chain. Adding these will add weight to the chainsaw so keep that in mind. More powerful chainsaws come with bumper spikes, also called dogs. These come in one or two sets attached to the saw beside the bar. The spikes bite into the wood and make cutting through a log easier and faster. A caution: Don't put a chainsaw on top of the wood on your pickup truck or trailer and expect it to stay there as you drive home. You would think this would be logical but I have seen several chainsaws that have fallen off the back of the pickup truck or trailer and needed extensive repairs before they could be used again. Echo says that all their chainsaws are professional grade. All Echo chainsaws come with a Kickback guard that can be installed on the end of the bar. There are 3 Echo Models in the comparison; CS-590 Timber Wolf, CS-490 and CS-400. Echo CS-590 Timber Wolf professional grade chainsaw has a 59.8 cc engine and comes with a 24" bar. Its dry weight is 13.2 pounds and it is a very easy to start chainsaw. It has a 4.8 start rating. This saw ranked #1 in our comparison. It had the largest engine, longest bar and cost the most. This saw would handle any homestead cutting job, even a 30" or more diameter oak, ash or maple tree. It's priced around $400 and has a 5 year consumer warranty. Of the 8 chainsaws compared, the Echo CS-590 Timber Wolf (link to read reviews on Amazon) easily won over the others. Besides having the largest engine and longest bar it has bumper spikes between the bar and saw body. Toolboss.com did a comparison test of the Echo CS-590 Timber Wolf and the Husqvarna 460 Rancher. Both saws were comparable in engine size, weight, and bar length as tested. The Echo was the clear winner excelling in cutting speed, fuel capacity, better air cleaning system, having a spark arrestor standard, longer warranty and costing over $100 less than the Husqvarna! Echo CS-490 is the saw I use for most of my wood cutting chores. It is a professional grade chainsaw that has a 50.2 cc engine and a 20" bar. It's dry weight is 10.6 pounds and it has a vibration dampening system to reduce user fatigue and bumper spikes between the bar and saw body. This Echo CS-490 (link to read reviews on Amazon) saw has a 4.9 star rating and a 5 year consumer warranty. This saw is second in the comparison winning over all but the Echo CS-590 Timber Wolf. Living in the Northwest where most of the trees cut for firewood are conifers, the CS-490 is all the saw I need. It is lightweight enough to use all day long and cuts great. I have cut down trees that are 30" in diameter with my CS-490. I have found it easy to start and it cuts as well as a friend's Husqvarna chainsaw with a similar sized engine and bar. The price is around $350, over $100 less than my friend paid for his Ranch grade, not professional grade, Husqvarna. Echo CS-400 is a very affordable professional grade chainsaw that comes with a 40.2 cc engine, 18" bar and it's dry weight is a mere 10.1 pounds. It is easy starting and has a vibration dampening system that reduces user fatigue and has bumper spikes between the bar and saw body. It comes with a 5 year consumer warranty. The Echo CS-400 (link to read reviews on Amazon) is a great saw for medium sized trees and for those homesteaders who have passed the retirement age and find they are not quite as robust as they were a few years ago. This saw has a 5 star rating. It's priced around $300. The CS-400 tied with the Poulan Pro PP5020AV for third place. It weighs less, has a longer warranty and a higher star rating than the Poulan. Echo chainsaws do not always have the reputation of a Stihl or Husqvarna chainsaw. But they can keep up with and in many instances out cut the same sized Stihl or Husqvarna chainsaw. You pay less money for the same or better performance plus you get a much longer warranty than the Stihl or Husqvarna which come with a 1 year warranty. My first chainsaw, a Christmas gift some 38 years ago was a Craftsman chainsaw that was made by Poulan. It is a small saw with a 37.7 cc engine. It's dry weight is under 8 pounds without the 16" bar and chain. The first tree I cut down was an oak tree that was 20 inches in diameter. By the way, that little Poulan is still a great running chainsaw today. Poulan Pro PP5020AV has a 20" bar and a 50 cc engine. It weighs 13.2 pounds and has a vibration dampening system to reduce user fatigue. This Poulan Pro PP5020AV (link to read reviews on Amazon) saw has bumper spikes between the bar and saw body, a 4.1 star rating and comes with a carrying case. Cost is about $275. It comes with a 2 year consumer warranty. This chain saw tied with the Echo CS-400 for third place even though it has a larger engine, longer bar and a slightly lower cost. This was compared against the CS-400's lower weight, longer warranty and higher star rating than the Poulan's. The weight of the Poulan Pro PP5020AV played a large role in the analysis of this saw. It weighs 30% more than the Echo CS-400 and 25% more than the Echo CS-490 and weighs the same as the Echo CS-590 Timber Wolf. Poulan Pro 18" is a chainsaw with a 42 cc engine. It weighs 13 pounds, has an 18" bar and anti-vibration technology to reduce user fatigue. The Poulan Pro 18" (link to read reviews on Amazon) has a 4.2 star rating and a 2 year consumer warranty. Costs about $160. The Poulan Pro 18" placed 5th in comparison behind the above chainsaws and the Remington RM5118R. The Remington RM5118R has a larger engine, bumper spikes and a higher star rating. Based on my experience with Poulan, their saws should last for several years of cutting 5 to 10 cords of firewood each year as long as you keep them properly maintained. The Remington RM5118R is a chainsaw that is rated as a heavy duty chainsaw. It is the heaviest of the saws listed here at 17.5 pounds. It has an 18" bar and a 51 cc engine. With an engine that size it should make short work of medium sized trees and be good for cutting downed trees into firewood. It has anti-vibration handles to reduce user fatigue. It is rated at 4.5 stars, has a 2 year warranty and comes with a storage case. Cost is about $220. Overall in the comparisons this saw placed fourth based on its engine size, presence of bumper spikes and 4.5 star rating. This saw, is the heaviest of the 8 chainsaws, weighing 4.3 pounds dry weight more than the #1 rated Echo CS-590 Timber Wolf that has a larger engine and longer bar and almost a full 7 pounds heavier than the #2 rated Echo CS-490 which has a longer bar and a comparable engine size. Both Echo saws have a 2 1/2 times longer warranty than the Remington RM5118R. This Remington RM5118R chainsaw would tire out a man not used to using a chainsaw on a daily basis much quicker the other chainsaws in the comparison. The Hitachi CS33EB16 is a saw that has a 32.2 cc engine and a 16" bar. It is on the small size, engine wise, for cutting large trees. It should be good for small and okay for medium sized trees and for cutting firewood length logs once a tree is down. Its light weight makes this a good saw to use to teach responsible young teenagers chainsaw usage and safety. It finished 6th overall in the comparison, just edging ahead of the Homelite ZR10568 based upon its lower weight, longer length of warranty and higher star rating. Having the smallest engine size hurt this chainsaw in the rankings. The Homelite ZR10568 is a saw that has a 38 cc engine and a 16" bar. It is vibration dampened to reduce owner fatigue. Weight is 9.8 pounds and it is rated at 4.3 stars. The website, bestofmachinery.com, tested the Homelite ZR10568 saw in its tests of professional grade chainsaws. It has a 2 year warranty and the cost is about $110. Even though it has a larger engine size, cuts faster than the Hitachi CS33EB16 and costs roughly half of what the Hitachi costs, it was nudged out by the Hitachi which beat it based on lower weight, longer length of warranty and the Hitachi's slightly higher star rating. All in all, the comparison with the Hitachi CS33EB16 was very close. A few years ago, I would harvest firewood with a friend who swore by Homelite chainsaws. All I ever saw him use was a Homelite. He had heated with wood for nearly 20 years and claimed to have used Homelite chainsaws exclusively. There is no denying that they are a good saw for the price you pay for one. Anytime a power tool is used a lot there is the chance it will eventually sustain some wear and tear. If this wear and tear is not taken care of it will shorten the life of even the best chainsaws. This is where regular maintenance of the chainsaw comes in. Regular, proper maintenance keeps your saw running like new and ready for work whenever it is needed. Professional grade chainsaws are designed to be disassembled and reassembled quickly and easily. This allows you to remove any worn or damaged parts, put the saw back together and return to using it in a relatively short period of time. For those familiar with 2-cycle gas engines and those that have mechanical aptitude, you will be able to perform much of the maintenance on your chainsaw yourself. For those who do not have the mechanical aptitude or do not desire to do all the maintenance themselves, there is usually a shop nearby that has a factory trained service person. If you do not want to do the repairs yourself, one good idea is to have the saw checked over by a repair man at the end of each wood cutting season. They will check the saw over, tune it for optimal performance and sharpen the chain so it is ready to go when the next wood cutting season starts. The cost for this service varies across the country. There will be times when you're using the saw and no matter how careful you are, you will hit a rock or the saw will cut into the dirt. This along with just cutting wood will dull the chain. With the proper sized round file for the teeth on your chain and the file set into a file guide, a few passes on each tooth and you will be back to cutting with a sharp chain. The manual that comes with your chainsaw will tell you the proper size of round file to use when sharpening your chain. Some homesteaders may want to purchase an electric chainsaw chain sharpener (link to read reviews on Amazon). At the end of each season they will sharpen all their chains so they are ready for the next wood cutting season. An electric chainsaw chain sharpener will do a better job of sharpening the chains than you can do with a hand file. A chainsaw chain needs to be adjusted to the proper tightness. If it is too tight the bar wears out faster, a lot of the saw's power is wasted just moving the chain and the saw will not cut as well. If the chain is too loose it will come off the bar. The chain needs to be adjusted to where you can pick up slightly on the chain but the links will not come out of the bar groove. 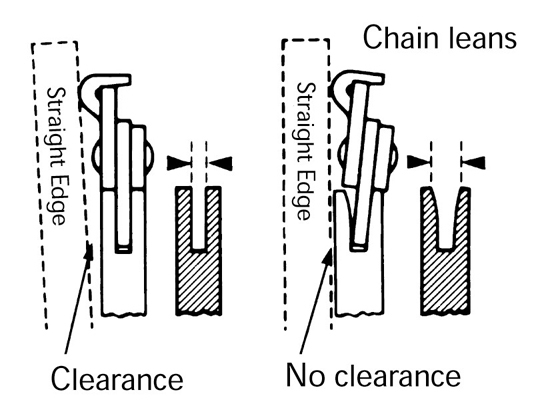 To adjust the slack in the chain, you need to adjust the length of the bar. Lift up slightly on the end of the bar tip while turning the chain tension screw clockwise until the slack is removed from the chain. The tension screw is located either underneath the nuts holding the bar in place or between the engine and bar. Tighten the nuts that hold the bar in place. The only tool needed to do this is the scwrench, the tool that is a combination of 2 wrench sizes and a screw driver, that comes with the chainsaw. If you do not have a scwrench, a regular blade screw driver and a socket wrench can be used. First, remove the old chain. This is done by removing the cover on the right side of the chainsaw. This cover goes over the rear of the bar, chain and the clutch. The cover is commonly held on by two nuts. Unscrew the nuts and remove the plate. There may be a thin metal plate resting on the bolts the nuts came off of. You might as well take that plate off also, otherwise it will just fall off anyway. 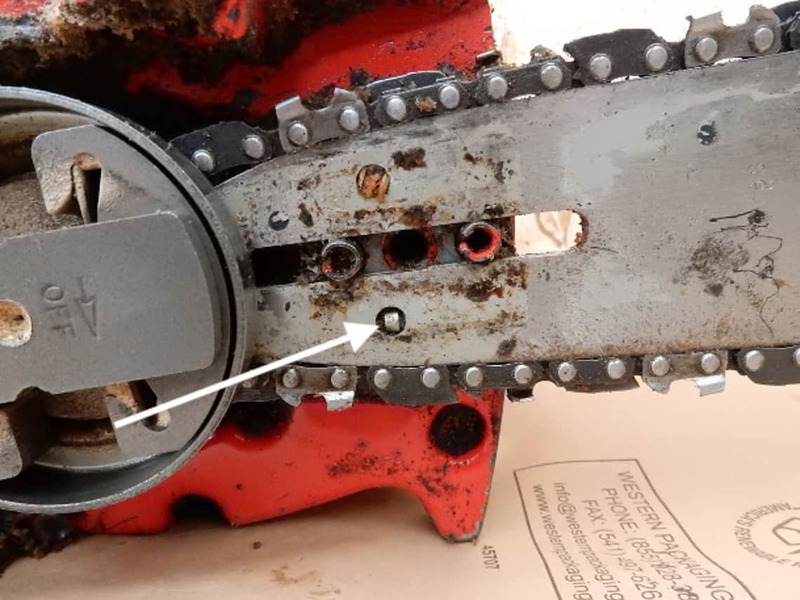 Some chainsaws have the chainsaw brake attached to the side plate. If this is the case be sure to unlock the brake before removing the side plate. Failure to do this can make putting the side plate back into position very difficult to impossible. Second, release the chain tension. This is done by pushing the chainsaw bar back toward the saw. If the tension screw is between the bar and saw body pull the bar away from the saw body slightly so the tension adjustment pin does not prevent pushing the bar back toward the saw. Third, remove the old chainsaw chain. The chain is easy to remove now because of all the slack it has in it. Pull the drive links out of the guide in the bar and then slip the other end of the chain from around the clutch drum. Fourth, loosen the tensioning screw on saws where it is located between the bar and the saw's body. On saws where the tension screw is located underneath the side plate bolts the side plate is already off the saw. Turn the screw counter clockwise with the screw driver part of the scwrench or a straight blade screw driver. This will make installing the new chain easier. Fifth, thread the new chain or the sharpened chain onto the saw. Start by carefully placing this chain around the clutch drum first. Be sure the drive links engage in the sprocket. Then thread the drive links into the guide bar and all the way around the bar's nose. Seventh, replace the side plate. If your saw had the thin metal plate resting on the bolts, replace it first. Then replace the side plate. If the tension screw is below the nuts holding the side plate on be sure the adjustment pin on the side plate fits into the hole in the bar. Only tighten the nuts hand tight. There will still be a little slack in the chain. If you tighten the nuts down tight, you will not be able to tighten the chain. Eighth, tighten the chain. This is done by turning the tensioning screw clockwise. Turn it until the slack is taken out of the chain and you can just pull it up slightly from the center of the bar. Check to be sure the chain moves easily around the bar, careful that you do not cut yourself on the chain's teeth. I usually wear a glove when I check the chain's movement. Now you can tighten the nuts on the side plate down tight. Replace the spark plug wire onto the spark plug and you are ready to go! the groove in the guide bar is splayed, has widened some with use. If the bar is splayed, this allows the chain to lean a little to one side which results in a cut that is not straight. To remedy this problem first try sharpening every other link in the chain, the links sharpened by your non-dominate hand. If this cures the problem you did not sharpen the chain evenly when you were using your non-dominate hand. If after trying this the chain still cuts at an angle, try turning the bar over if the nose of the bar is symmetrical. Some bar noses are not symmetrical. This is a job that can be done in about 10 to 15 minutes even if you are out in the woods. Always take the scwrench or a screw driver and socket wrench with you when you go to cut wood. To turn the bar over, follow the instructions above for changing the saw's chain. When the chain is off the bar, pull the bar off the bolts and turn it to where the side that was up is now the side that is down. Replace the chain and tighten the tension as described above. Many times after this is done the saw will cut straight. You should have a spare bar and a spare chain for your saw. When it starts cutting at an angle again, put the new bar on the saw. To replace the bar with a new one, follow the same basic procedure described in turning the bar. Merely replace the bar instead of turning it over. When small single cylinder gas engines, whether 2 cycle or 4 cycle, become hard to start or do not run like they should, the problem, many times, is the spark plug. It is a good idea to have a spare spark plug for your chainsaw. Pull the spark plug wire from the old spark plug. Using the larger wrench side of the scwrench, remove the old spark plug. Spark plugs are usually properly gapped when they come from the factory. You can check the gap with a spark plug gap tool. The manual that came with the chainsaw will tell you what the proper gap is. Start the new plug turning into the cylinder with your fingers if possible. Then using the scwrench, tighten the plug down snuggly. Be sure you are using good gas, many chainsaws run better on 89 octane mid-grade gas than they do on 87 octane regular gas. This can be especially true of professional grade chainsaws. Be sure you have a good quality 2 cycle oil mixed in with the gas in the proper proportion as set out in your chainsaw manual. If this does not restore your saw to like new running condition it is time to clean the air filter. If a new spark plug and a new or cleaned air filter does not make the saw run like new again, you will need to take it into a shop for them to see what else might be wrong with it. It is a good idea to replace a chainsaw air filter at the end of each wood cutting season. During the cutting season you should clean the air filter every 5 to 8 hours of usage. If the air filter is dirty the chainsaw can lose power and it might even stall. First, know where the air filter is located. It is usually on the back side of the engine and on top or near the top. The chainsaw manual will tell you where it is. Look for a raised circular area on the chainsaw that may have slits or holes in it that allow the air to enter through the saw's cover. There maybe screws holding the cover on or there may be a device that can be turned by hand. Remove the screws or the device and gently lift off the cover and set them aside. Second, there may be a second cover closer to the rear of the engine. If so, this will be the air filter cover. There could be more screws to remove. Lift off the air filter cover and set it aside. The air filter should now lift out. Third, clean the air filter. Gently tap the air filter's hard plastic edge, if it has one, on a hard surface. This loosens dust and debris which will fall off the filter. Place the filter in the hot, soapy, sudsy water. Let the filter settle to the bottom for several minutes. Then swish the filter around in the water. Next gently scrub the filter with the toothbrush. Then place the filter in the bucket of cold water. Swish it around to remove the soapy residue. Remove the filter and set it aside to air dry. Fourth, clean the air filter cover. Remove the dirt and debris from the air filter and chainsaw covers. Place them in the hot soapy water and scrub them thoroughly with the toothbrush. Be sure both the inside and outside of the covers are clean. Rinse them off in the cold water and let them air dry. Fifth, when the filter and covers are dry, replace them in the reverse order that you removed them. Do not over tighten the screws or the hand turned device! What is a good chainsaw to take up into a tree with you? An Echo CS-271T because it is the smallest and yet it is a powerful chainsaw. It is made specifically for tree professionals. It has a 26.9 cc engine and either a 12" bar. It weighs 6.6 pounds and is a top handle model chainsaw. Cost is about $300. It has a star rating of 4.7. If you do not want to spend the money for the Echo CS-271T, purchase a light weight chain saw with a 12" to 14" bar. This saw does not necessarily need to be professional grade since most homesteaders do not spend much time up in a tree with a chainsaw. This saw can also be the one used to clear brush. I use my little Craftsman made by Poulan for these purposes. What is bucking a tree? Bucking is cutting a felled tree into logs. If you are cutting from the branches down toward the trunk it is overbucking. If you are cutting from the trunk up toward the branches it is underbucking. More information on cutting down trees can be found here. Does anyone make a left handed chainsaw? No, in holding a chainsaw the right hand should control the throttle and the left hand hold the guide bar. When cutting the left arm should be as straight as possible. How to hold a chainsaw is the same for lefties and righties. More information can be found here. What is the most common firewood length? The most common length for firewood is 16". This length fits well in wood burning stoves rated at 1500 square feet heating capacity or more.